Billy and I are Mexican food freaks! We are blessed to have a few really great Mexican restaurants nearby, so we probably eat Mexican every other week. Our favorite is Las Fajitas and we almost always get the same thing when we eat there, Billy gets sizzling fajitas and I almost always get some kind of tostada. Billy really loves tostadas too, but he doesn’t have to order them; he not only eats his fajitas, but some of my tostadas as well. That man can pack the food away! My friends think that it’s fun when Billy comes for dinner, because he eats so much; I think it makes them feel appreciated. What I love about tostadas is that they’re like open face tacos, but with more stuff. 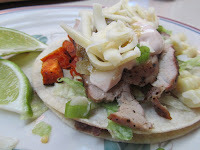 With a taco you must be careful not over fill it so that you can still pick it up. With a tostada you can pile as much as you like on the top and not worry about half the stuff falling in your lap. I also love that because there’s always a nice salad on the top of a tostada, when I leave the table after eating it I don’t feel grossly over full. 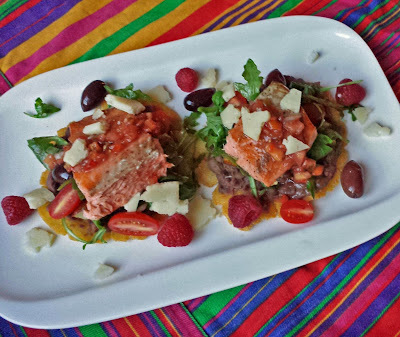 Each element of this tostada, though it may seem strange to some, totally works. Each layer compliments the next so that each bite is the perfect bite! Our favorite Mexican restaurant puts potatoes on their tostadas, and so do I.
Fry up a small, diced potato in a little olive oil, season them with a little salt and pepper as soon as they come out of the pan; and keep the potatoes warm. If you're in a hurry you don't have to do this, but it sure is yummy. While the potatoes are cooking mix together a little store bought salsa with a touch of raspberry preserves and the juice of half a lime. Also heat up some canned refried black beans. I made a half batch of my own Handmade Corn Tortillas and fried them, because fresh tortillas are amazing; but if you like you may fry up some store bought corn tortillas, use this oven method, or buy ready-made tostada shells. Season a couple of salmon fillets with salt and pepper, coat the bottom of a skillet in olive oil and then sear the over medium-high heat. Hint; allow the salmon to sit out at room temperature for about 15 minutes before cooking it. Cook the salmon for 1 1/2 to 3 minutes on each side. Now begin to assemble the tostadas! Slather some of the heated refried black beans on the bottom and then layer on some of the fried potatoes. Next some arugula that has been dressed with a bit of olive oil, white balsamic vinegar, salt and pepper. Sprinkle some halved grape or cherry tomatoes and some Kalamata olives. Place half of a salmon fillet and squeeze a little fresh lime over the salmon. Finally top with the raspberry salsa that you mixed earlier and some Manchego or Pecorino Romano cheese, and maybe a garnish or fresh raspberries if you have any on hand. 1. Heat about 1 Tbsp. of olive oil in a large skillet over medium-high heat. Sauté the diced potatoes until they are golden brown on all sides. Remove them from the pan, season with salt and pepper, set to the side and keep warm. (The potatoes are optional). 2. Heat the canned refried beans according to the directions on the can. 3. In a small bowl mix together the salsa, raspberry preserves, and the juice of half a lime. Set to the side. 4. Use the same skillet that the potatoes were cooked in. Heat a tablespoon of olive oil over medium-high heat. Season both sides of the salmon with salt and pepper. Lay the salmon in the hot pan and cook for about 1 1/2 minutes on each side for medium, 3 minutes on each side for well done. (Hint, allow your fish to sit out at room temperature for about 15 minutes before cooking) Remove from the heat and squeeze the juice of half a lime over the top. Cut each fillet half. 5. In a medium bowl toss the arugula with 1 ½ tsp. olive oil, balsamic vinegar, and a pinch each of salt & pepper. 6. Now assemble the tostadas. 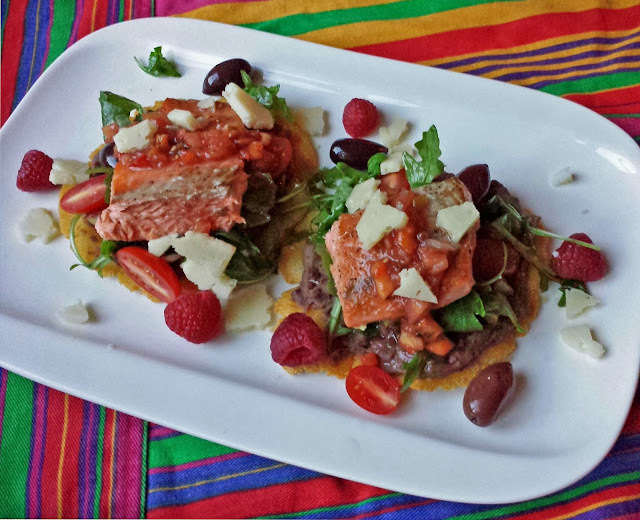 On each tostada shell smear a good dollop of refried black beans, scatter a few of the sautéed potatoes, mound the arugula on top of that, sprinkle the tomatoes and Kalamata olives over the arugula, place the salmon on the top, spoon some of the raspberry salsa mixture on to the salmon, and finish with a scattering of the crumbled cheese. 7. If you’re feeling fancy you may garnish the plate with just a few fresh raspberries. Oh these things are making my mouth water so hard...I may just have to make them for breakfast! I love Mexican food too and it's been ages since I've had refried beans. Salmon? My faaaavorite! So all over this!